ANN ARBOR MICHIGAN MEDICAL MARIJUANA CERTIFICATIONS – NOW OPEN 7 DAYS – WHY WAIT? GET LEGAL NOW! 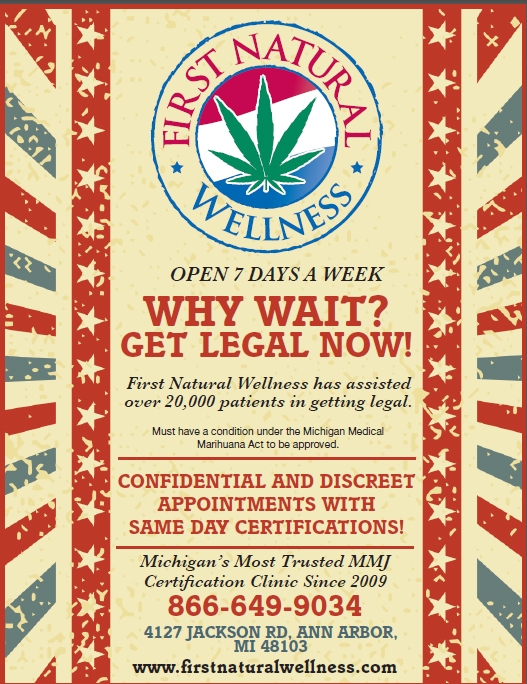 : First Natural Wellness – $60 Fast, Affordable, Same Day Bona Fide Michigan Medical Marijuana Card Serving Ann Arbor, Plymouth, Canton, Taylor, Brighton, Whitmore Lake, Howell, Jackson, Detroit, Flint, Grand Rapids, All The Way To Marquette! ANN ARBOR MICHIGAN MEDICAL MARIJUANA CERTIFICATIONS – NOW OPEN 7 DAYS – WHY WAIT? GET LEGAL NOW! Hi. I was diagnosed in 2002 with mild-moderate Crohn’s Disease. I have my paperwork from my doctor at the time indicating this. I currently do not take any meds for the Crohn’s. I still experience pain and other issues. Am I a candidate for certification with my diagnosis from 2002? If your condition is causing you to suffer from one of the qualifying conditions in the Michigan Medical Marijuana act then you will qualify for a medical marijuana card. For instance, if the Crohn’s disease is causing you to have chronic & severe pain then that would qualify you. Please feel free to call us at 866-649-9034 and we can help answer any further questions you have. Thanks.